Today we’re going to talk about space. Take a cue from the best and brightest and you could have compelling and effective websites without a degree in astrophysics. Space has been around for a fairly long time, and is actually quite large. In 1958, the United States established the National Aeronautics and Space Administration (NASA) as a way to kickstart space exploration. These are the folks responsible for determining what objects and/or individuals to launch in orbit next. They also have quite a few million-dollar toys floating around, with even more on the way. …thousands of people have been working around the world — and off of it — for 50 years, trying to answer some basic questions. What’s out there in space? How do we get there? What will we find? What can we learn there, or learn just by trying to get there, that will make life better here on Earth? What’s so great about NASA’s internet? NASA may have fascinating work, but what makes them such a model for effective web design? Incidentally, NASA has a lot to offer to the web design community besides space-faring geniuses. Coding and design aside, their web presence is a prime example of effective communication. As web designers, it’s sometimes hard to picture what happens after a website gets published. Most websites are made to spread information to a designated audience (e.g. homeowners). Design helps, but delivery and technique are just as important. This is the part where NASA shines, and what this article highlights. This is where a lot of people get mixed up. There is a difference between “dumbing down” a subject and making it accessible. Writing in words that are easy to understand is not a bad thing — especially if the goal is effective communication. Where the rest of us have little idea about the mysteries of space, NASA always manages to bring us up to speed. What happened? Why does it matter? This is advanced journalism, because the topics are (quite literally) rocket science. They can’t afford not to simplify the topics — very few people would understand otherwise. Even though the processes are so advanced, you don’t need a professional background in science to appreciate the site’s content. To the average person, NASA is a thrilling portal to amazing photographs of places they wouldn’t see otherwise. 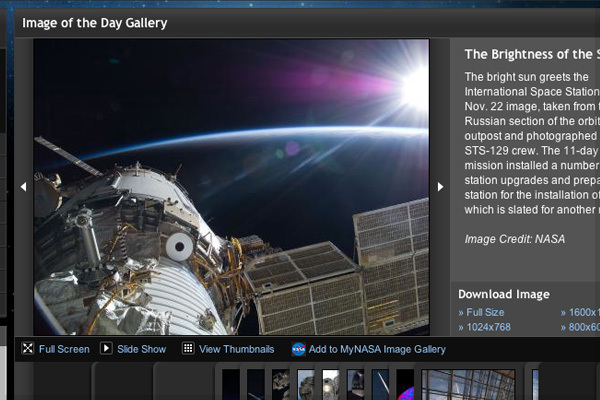 NASA has learned to harness that excitement by publishing daily content of space imagery and updates. NASA has the benefit of having work that results in genuinely fascinating news. Lakes discovered on a moon of Saturn? Pictures from the world’s most powerful telescopes? That’s hard to match. But even with such unique content, how do you take this information and then present it effectively? The entire site is a landing pad for people of all backgrounds. All the way from kindergarten classes looking for moon facts, to astronomers searching for black hole physics. This seems like it would be a hard spread. Friendlier terms like “Play and Learn” and “Discover cool stuff” replace the copy for older audiences. Students in higher age groups are met with more mature topics like “research tools” and “current opportunities.” An invitation to “play fun games” with cartoon imagery just wouldn’t have the same effect with older groups. This separation and re-presentation of content isn’t limited to just student pages and grade level. The same trends can be seen under the sections dedicated to educators, media, and policymakers. They know how to engage with today’s audience. In a recent contest, voters were asked to choose the name of a new space station module. As fans of Stephen Colbert might remember, this was highly publicized. Social media played a large role in getting involvement going. NASA does a great job of reminding the community that they don’t take themselves as seriously as you’d think. Since it is also an agency of the government, NASA is subject to a high level of transparency in its ongoing operations. As recent articles have pointed out, being transparent works wonders for credibility. They maintain over two dozen twitter accounts, including those belonging to individual astronauts. They keep in touch with modern events and trends. In between making calculations for satellite launches, they still have time to write up compelling posts about the 2012 doomsday theories brought on by a movie. Interested in seeing all the ways NASA interacts with its audience? Take a look at the sprawling “Connect with Us” page. They realize the average visitor is not a rocket scientist and plan accordingly. They have an active community involvement across social media. They know how to make their work relevant to the average person. They have a high level of transparency about operations. Please remember that this article is not saying that NASA is the only site to successfully use these techniques, nor were they the first. They are just a good example of these tactics in practice. Do you have any other sites that you’ve learned a lot from unintentionally? See anything in NASA’s setup that you think could be done differently? Share your thoughts in the comments below. Interesting article, a bit different from the usual old thing. Excellent points you bring up Zach. great job on the analysis of the NASA website. I think ever since Obama became President, the use of social media in government has been increasing. I think his campaign set the precedence for that. I’m definitely looking forward to more articles like this one in the future. Really interesting perspective, I like the focus on content writing. The balence between “dumbing down” and burying your audience in techno-babble is an important one that a lot of sites have trouble achieving. Great post! It’s always import to target your audience when designing… Great tips none the less though. 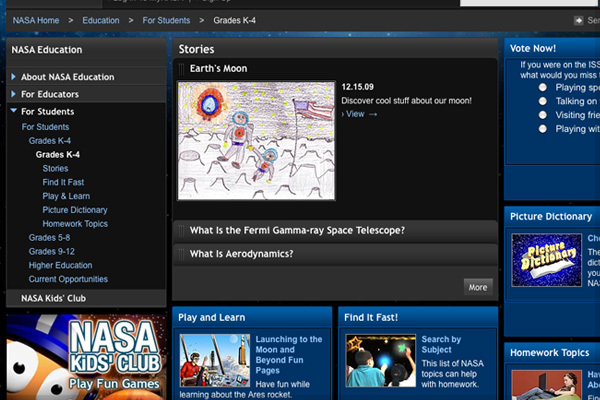 I’ve been on NASA’s website before and I must agree that it is engaging. I think it’s incredibly smart of them to create additional content, that is educational, entertaining, and engaging, as well as the need-to-know information. A perfect example of how a website should be executed! I love to look at other industries and apply strategies and techniques to my own (web design). I believe that is a key ingredient in innovation. Great post! One other key to learn from NASA: how to have an effective site LAUNCH (sorry, I couldn’t resist). 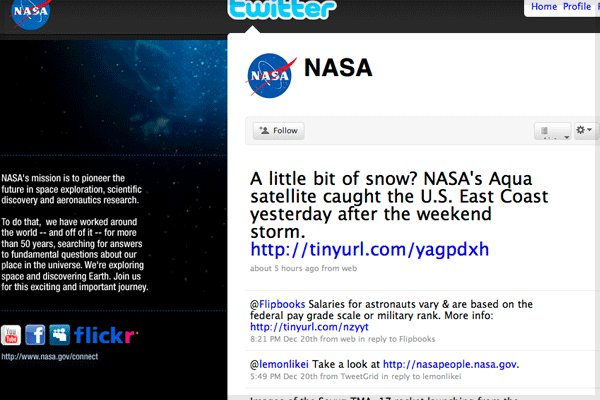 I’ve been to NASA and never thought that it has any relation to web design…. great article dude…. The first image is my desktop background! Good post. I thought nasa stood for National American Space Agency? Very interesting post….. webdesign has gone universal and into space now …. As Michael correctly pointed out, the first A in NASA does stand for aeronautics (not just air). I’ve updated the post accordingly. Sorry for any confusion! due to proprietary plugins that are required. This is definitely NOT good web design. Now let’s talk about content. There is a difference between making content understandable and dumbing it down to the point of nonsense. Having taught undergraduate astronomy and physics for nearly 18 years, I have evidence that NASA is guilty of the latter. Nonsense words like “gravity”, “microgravity”, and “escape velocity” are used by NASA with certain assumptions about what the consumer already knows, but those assumptions are wrong most of the time. For instance, are you aware that when most (VAST majority) of students hear the word “gravity”, they think of a material substance rather than a natural physical interaction or attractive behavior? It’s true. This in turn leads to such nonsense as thinking that Earth “has gravity” but Moon doesn’t. These misconceptions are exceptionally difficult to dispel in the classroom. BTW, I’ve presented on this very issue at both state level and national AAPT (American Association of Physics Teachers) conferences among my academic peers. Finally, if a website doesn’t validate (this page doesn’t) against the W3C standards, I can’t take anything its “designer” says seriously. I’m a proud NASA supporter and I make heavy use of NASA websites both personally and professionally, but there are problems with websites that this article glosses over or completely ignores. BTW, the comments about Flash were not necessarily directed at NASA because I’ve not encountered Flash content on a NASA site yet. Sorry for the unintended implication! Are some of you people using Firefox 3.5 ? Not only installing WM plugin won’t solve the issue (for me…), but that’s using the 3 worse plugins (proprietary formats) available. So, sorry, that is not what I call great web site design. Great website, especially considering an undoubtedly limited operating budget and seemingly endless content to mine. As a result, I imagine NASA.gov performs 10+ times as well as NASA TV in terms of engaging audience. Considering the latest reports says avg U.S. person still spends many more hours watching TV than using the web, would love to see their channel show the same quality. @reivax I’m using Firefox 3.5 and have never had any difficulty accessing video or NASA TV on their website (and I visit NASA.gov multiple times a week for such content). I can’t imagine what problem it is you and other are having. @Joe you obviously have some sort of grudge against flash (COUGH *apple fan boy*). I am for w3c standards but quick time? really? The content of a website is part of web design anything on the web page is considered a design aspect. A High School web design teacher said to me that one of the main thing students need to learn for web design is how to properly format content. She told me that most of her students had pages that were wall’s of text. good post. I did visit nasa’s site and you’re right on the dot. @Joe regarding: “Finally, if a website doesn’t validate (this page doesn’t) against the W3C standards, I can’t take anything its “designer” says seriously”. What a great Information about Nasa and related. We have really enjoyed the post. Nice factors…I might observe that as somebody who actually doesn’t comment to blogs a lot (the truth is, this may be my first submit), I don’t suppose the time period “lurker” is very flattering to a non-posting reader. It’s not your fault at all, however perhaps the blogosphere might give you a greater, non-creepy name for the 90% of us that take pleasure in reading the posts. There is a difference between making content understandable and dumbing it down to the point of nonsense. Having taught undergraduate astronomy and physics for nearly 18 years, I have evidence that NASA is guilty of the latter. Nonsense words like “gravity”, “microgravity”, and “escape velocity” are used by NASA with certain assumptions about what the consumer already knows, but those assumptions are wrong most of the time. Excellent article…your points are well taken…It’s obvious Nasa has no problem with design but they had to articulate their content well in order to satisfy different types in the audience.